Designed specifically for 35mm DIN rail, Airpax ICL series Rail-Mount Hydraulic Magnetic circuit breakers offer the advantage of quick and easy mounting or removal which results in efficient and economical wiring while conserving space. These circuit breakers are available in 1, 2, 3 pole models with a choice of handle colour with on/off and international I/O markings. These breakers are approved to CCC, CCRC, UL (pending) and IEC (pending) standards. Typical applications include railway signalling, computers, telecom/datacom equipment, telecommunications, medical & industrial equipment etc. They provide the reliable performance associated with hydraulic magnetic circuit protection. 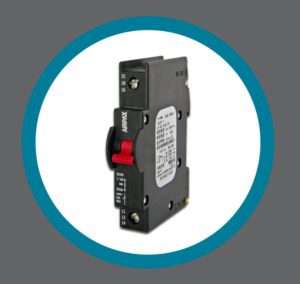 These circuit breakers are designed to mount on standard 35mm DIN rails, such as 35×7.5 or 35×15 DIN EN50022. To further discuss this product, or any other of our Rail Application products, please contact Charcroft at [email protected], or 01591 610408.